Two hearts, one amazing future. This combination is as perfectly suited to each other as the bride and groom. 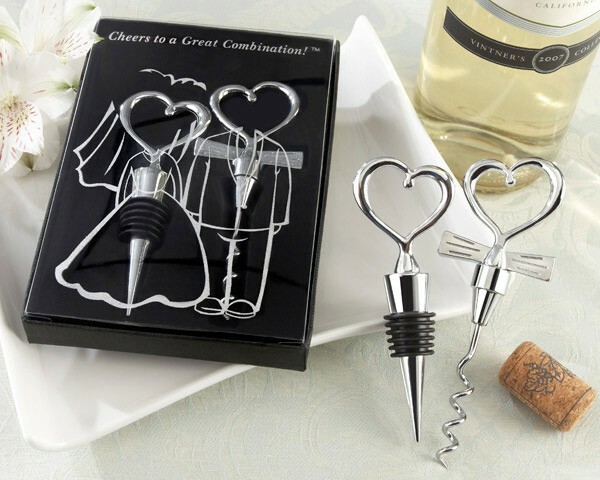 Included is one chrome Heart Shaped Bottle Stopper and one chrome Tuxedo Heart Corkscrew in whimsical packaging. A flawless gift for anyone involved in the wedding--from planners or florists to bridesmaids and groomsmen, and, of course, the bride and groom! Also makes a romantic and practical favor for wedding guests. They'll enjoy and use it for years, as a meaningful token of a lovely wedding. It's a great and original Engagement Party gift or favor, and Bridal Shower gift or favor too. (Wrap one up to give away as a shower game prize!). The Bottle Stopper and Corkscrew are presented in an elegant velvet lined black gift box with a clear top. Each box has a silver outline of a bride and groom and reads, "Cheers to a Great Combination!" 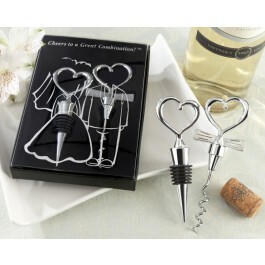 Heart Shaped Bottle Stopper measures 4 3/4" long and Tuxedo Heart Corkscrew is 5" long. Gift box measures approximately 6 1/2" x 4 1/2".